The Scitec T5-08 is a high-performance hotel phone designed with the user in mind. The unit offers 5 programmable service keys, one-touch message retrieval, and customizable volume controls. The hotel industry is highly competitive and everyone is fighting to be the leader in customer service. The right phone makes a difference because it simplifies guest communication. 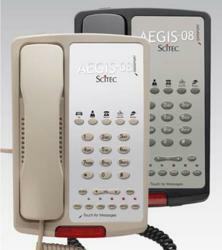 Telcom & Data, a leader in business phone systems, is proud to introduce Scitec’s T5-08 hotel phone. The unit is a two-line speakerphone featuring 5 programmable keys. With the simple push of a button, users can connect to the right department to schedule a wake-up call, order a meal, request a taxi, or ask for luggage assistance. In addition to the programmable service buttons, guests will enjoy one-touch message retrieval. The unit also features hold, redial, speaker, mute, and conference buttons. A high/low ringer switch and a 4-step handset volume control allows users to easily choose an audible level. The T5-08 boasts industrial grade construction and a matte finish. Black and ash color options are available to fit the décor of any room. Since 1996 Telcom & Data has been providing thousands of telecommunication solutions to organizations around the world to measurably improve communications. The company is a leading provider of video conferencing equipment, business phone systems, and mass notification products. Telcom & Data maintains a network of over 1500 technicians with locations in Chicago, Milwaukee and Miami. Scitec line-powered business telephones deliver cutting-edge telephony features at economy pricepoints. From SOHO, and SMB applications to larger Enterprise business, government, military or school applications, Scitec offers a full line of Caller ID and non-Caller ID telephone solutions.